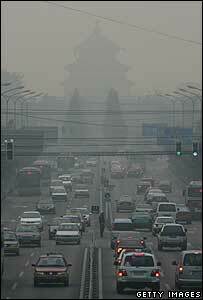 Olympic chief Jacques Rogge concedes that air pollution may now be an issue for athletes' health in Beijing during the 2008 Games. Rogge earlier denied fears over pollution, but has now suggested that certain events of more than one hour could be exacerbated by the weather. "We will see the weather, we may have to postpone some events," he admitted. The marathon, road cycling, triathlon, open water swimming and race walking are the events most at risk. The IOC president had said on Saturday that the health of the athletes was "absolutely not in any danger," before now appearing to review the situation. He added: "In these cases, we will analyse with the meteorological experts the predictions of the weather. "But for every effort under one hour there is no problem, no danger. The same goes for indoor sports." In March, Arne Ljungqvist, chairman of the IOC's medical commission, said the effects of Beijing's air pollution problems should not be overstated. He claimed were no health problems reported at test events in Beijing last summer or at the World Junior Championships in August 2006. "I believe the conditions will be good, although not necessarily ideal," Ljungqvist said. The air quality was monitored during last summer's test events in Beijing, with no health problems reported and findings indicating the health of the athletes was not impaired.